The Diaries of a Glam Mama: Dove Mahkotamu! I’ve always had very little hair. Not only that, my hair is really fine too. But after having both boys, hair loss has left me with an even smaller amount of hair. This became crystal clear for me a couple of years ago, at a surprise birthday party for my bestie. This person came up to me, and (in front of everyone) said loudly, “Wow, you’ve really lost a lot of hair. You’re practically bald!” Aside from being very, very rude, this person had a point – I had a major hair loss issue. Hair loss can be attributed to a lot of reasons, but I’m fairly certain that my main cause is stress – at that point in time, I had just become a single mother, and I was studying while also working. Nowadays, I think the main reason behind my hair loss might be the lack of time I have to care for my hair. Gone are the days I could go for scalp treatments once a month! So when I was invited to the Dove Mahkotamu two-day event last weekend, I was hella excited. I knew it was going to be fun, and that I’d be learning about the Dove Hair Fall Rescue range, but I had no idea how much I’d also learn about other things – read on to find out what! I arrived at the Shangri-La Hotel in Putrajaya on the first day, and was surprised by it’s location. It really felt like it was out in the middle of nowhere, which was a welcome respite from the busy-ness that was my week. Anyhow, after checking in, we were all invited for what was, to me, the best thing one could ever get at an event – a massage! The head and shoulder massage was absolute BLISS. I seriously needed it, and by the end of it, I was practically half asleep. The Dove Hair Tonic Treatment was applied directly onto my scalp and felt nice and cool on my scalp, which didn’t help in keeping me awake. Seriously, I was so relaxed that if I could’ve snuck away for a nap, I would have. It is said that the treatment would visibly reduce hair fall after two weeks. Alas, that was not to be, as we were all divided into groups and sent on to the first of two workshops for the day. The first one I went to was the Image Consulting workshop by Grooming Consultant Hanim Abdul Rahman, which was a lot of fun! Puan Hanim was so vivacious, and that spirit was contagious! One of my favorite activities for that particular workshop was when we all had to paste a piece of paper on our back and get at least 5 people to write positive things about us based on their first impressions – talk about an ego boost! Huhu...kembang kuncup ai! I'm assuming that last one was about my blush? The second workshop was the Relationship Consulting workshop by Aniqah Husda. One of the things I took away from this workshop was the three things anyone can do in order to maintain healthy and happy relationships: Acceptance, Understanding, and Appreciation. It’s so simple, these three things, but how many of us apply them in relationships that matter to us? Particularly our relationship with our kids? I like this concept so much that I may well write an entire post about it soon. 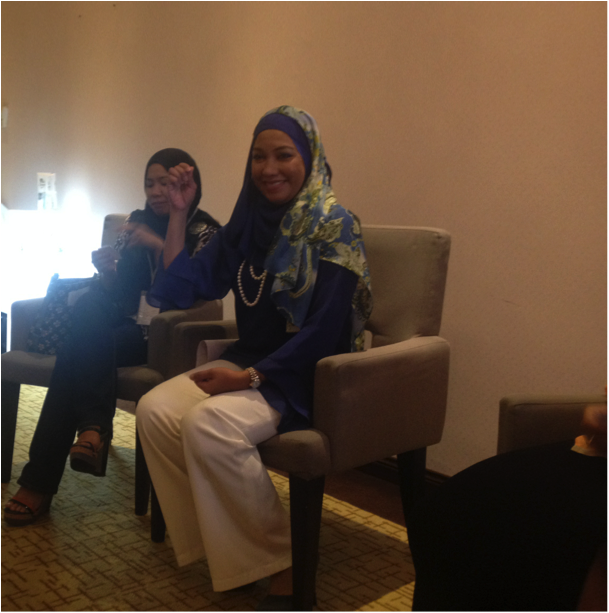 Puan Aniqa is so soft-spoken and gentle! With my belly full of the yummy pasta, I was worried about whether or not the other ladies would mistakenly congratulate me on being preggers :p Luckily we were given cute Dove bathrobes (read: big belly cover-up garment) as we went on to the next event – the Pillow Talk session! Because I managed to somehow stuff myself with marshmallows and candy despite being completely full mere minutes before…aaaaaaghhh…how to resist??!? Anyway, the event was memorable not only because we were all in bathrobes, but because it was the first time I’d ever seen a room full of women speak so openly and honestly about their hair loss. For me personally, I don’t really talk about it out of a combination of being embarrassed about it, and also thinking it’s a superficial thing to care about. Except that it’s not – there’s a reason why it’s called our crowning glory. It’s good to know that other women are as concerned as I am about our hair loss, and actually want to do something about it! After that, we all went back to our rooms. I don’t know what other people did, but I took a much-needed warm bath while watching Game Of Thrones. Can’t think of a better way to spend a Friday night! I only just got done with Season 3, so no spoilers please! On the second day, we got serious. First challenge was breakfast – I was still groggy from that massage and that bath, believe or not. But I managed to get some food in my mouth (as I somehow always do, pffft). 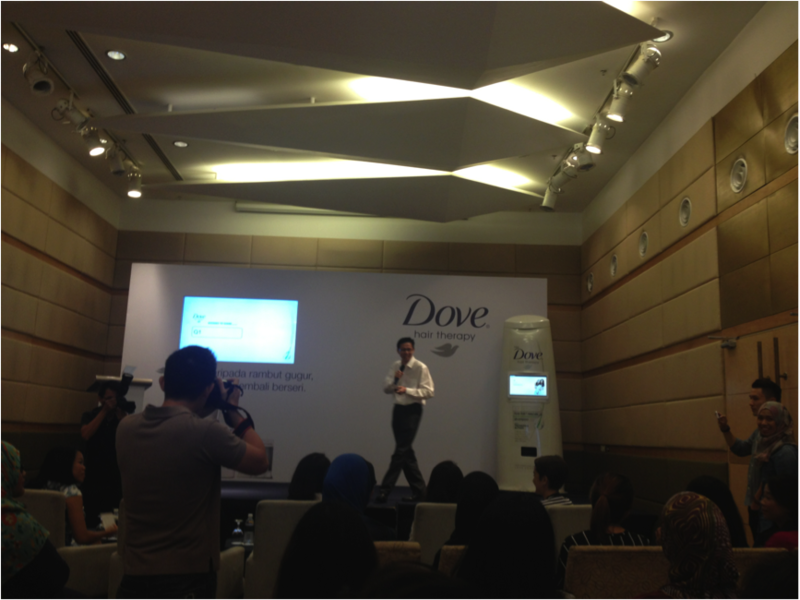 Once we were all seated in the hall, Mr John Goh from Dove conducted an enlightening presentation on hair loss and the technology of the Dove Hair Fall Rescue range. As it turns out, only 20% of hair loss is caused by hair breakage. So focusing on repairing hair damage is only going to help with a little bit of that hair loss. In fact, 80% of the time, hair loss occurs at the roots! That’s where Dove Hair Fall Therapy comes in – it targets the natural hair growth cycle in addition to targeting the hair damage. It contains anti-breakage technology to smooth the hair cuticles and prevent breakage, and it also has anti-shedding technology, which keeps hair on the head for longer, which in turn extends the hair growth cycle. It’s the complete solution for hair loss! I’m excited to see how the Dove Hair Fall Therapy range works for me – and you too! Join the Dove 14-Day Challenge by clicking here. You may just win prizes worth up to RM20,000. Not bad, huh?